The Paris Agreement doesn’t cover emissions from international shipping or air, but a global agreement on air travel is set to kick in soon. Here’s what you need to know to make sense of it. 14 November 2018 | Global climate talks are set to begin two weeks from now in Katowice, Poland, but quieter talks have been taking place out of the limelight, in Montreal, Canada, where negotiators from 192 countries are meeting under the auspices of the International Civil Aviation Organization (ICAO) to design a global carbon market for offsetting emissions from international flights, which aren’t included in the United Nations Framework Convention on Climate Change (UNFCCC). The offsetting program, called “CORSIA” (Carbon Offsetting and Reduction Scheme for International Aviation), will be phased in over seven years, with a pilot phase running from 2021 through 2023, during which countries can opt in or out (most have opted in), then a second voluntary phase from 2024 through 2026, and a final phase, running from 2027 through 2035 that is mandatory for all countries except the very poor. In essence, airlines will begin rigorously monitoring emissions in January, 2019, then capping emissions at 2020 levels beginning in 2021. Ecosystem Marketplace Manager Kelley Hamrick has been following carbon markets for five years, and we sat down for her take on how CORSIA is evolving and its role in global carbon markets. This conversation has been edited for clarity. How long have you been tracking carbon markets? I’ve been tracking carbon markets since joining Ecosystem Marketplace in 2013, but the organization published its first “State of the Voluntary Carbon Markets” report in 2007 – two years after the European Union’s Emission Trading Scheme (EU ETS) began. Amazingly, companies not regulated by the EU ETS program wanted to reduce emissions too, and many began buying voluntary carbon offsets, after they reached the financial or technological limit of what they could do in-house. That report was critical in tracking voluntary carbon offset purchases, and it provided legitimacy to this nascent market by providing data around the market size, average prices and more. That and subsequent reports also tracked the evolution and increasing use of third-party standards that provided necessary documentation of voluntary offsets’ on-the-ground impacts. Our reports have been used to engage new voluntary offset buyers and help policymakers value the standards and impact of voluntary carbon markets. How have voluntary markets changed over the years? 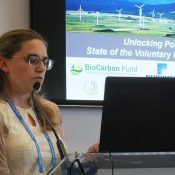 Buyers quickly learned that “voluntary” offsets still needed some sort of regulation or structure, and voluntary standard bodies played a crucial role in providing legitimacy to emerging carbon offset activities around the world. In 2007, only 64% of offsets were approved by a third-party standard bodies – compared to 99% in 2016. We’ve also seen a proliferation of project types – particularly in the supply of and demand for offsets related to land-use. A study was published last year that suggested that through these so-called “natural climate solutions,” we can achieve more than a third of the mitigation needed by 2030 to keep global warming under 2 degrees Celsius. That has led a lot of people to take a deeper look at forest and land-use offsets. Another big change is the way voluntary markets have influenced the compliance markets, largely because the participants – the project developers, standard bodies, registries and others – have been free to test new methods, with standard-setting bodies capturing and codifying what works to ensure environmental integrity. The most recent and in-progress example of this is the upcoming Carbon Offsetting and Reduction Scheme for International Aviation (CORSIA) program, overseen by the International Civil Aviation Organization (ICAO). Climate negotiators have always struggled with emissions from activities like international aviation and shipping, which are generated between countries rather than inside of them. For the former, the United Nations Framework Convention on Climate Change (UNFCCC) delegated this to ICAO, which is the UN agency charged with overseeing international flights. Like the UNFCCC, CORSIA is comprised of member states – in this case, 192 of them – and in 2013, the members set an aspirational goal of capping emissions from international flights at 2020 levels, even if the number of flights continue to increase. At the moment, airlines can improve fuel efficiency, shift to cleaner-burning fuels, and reduce the weight of planes… but the technology only goes so far. While we hope for – and expect – technological breakthroughs on those issues in the future, it is likely the airlines will need to use offsets in the short-term for some or all of their emissions. That’s where CORSIA comes in. The CORSIA program will allow airlines purchase offsets to meet the goal of carbon neutral growth post-2020. So CORSIA means airlines will only offset some emissions from flights? Correct – just their emissions above 2020 levels, and only for international flights. But that’s still a big amount! International air travel is a rapidly growing industry; the International Air Transport Association expects international air travel to almost double between 2016 and 2035. Throughout the industry’s history, increased air travel has meant increased emissions, that’s why decoupling them is so important. The way CORSIA plans to do that is by putting a price on carbon, and linking the airlines’ emissions with its balance sheet. Also, CORSIA isn’t just about offsetting: airlines can make use of alternative aviation fuels (like biofuels) or offsets. With a price on carbon, airlines will have an incentive to reduce emissions and catalyze investments in new low-emissions technology to do so. There are some cool examples of airlines beginning to make some big investments into biofuels, like Virgin, United and Cathay Pacific, which is all needed to bring down the cost of the fuel and the supply infrastructure needed at airports. Your v-carbon quarterly report included a special section on CORSIA. Why is it a big deal? It’s just one industry. First, climate impact. International aviation is responsible for an estimated 1.3% of global emissions. This program will help cap those emissions by ensuring future growth is carbon neutral. Second, global cooperation. All ICAO member states have already agreed to CORSIA’s overarching goal of carbon neutral growth. This is one of the first instances of developed and developing countries taking similar approaches in reducing emissions – and emissions reductions supply could similarity be completely global. Third, and finally, the impact on carbon markets. Research organizations have estimated that CORSIA could generate demand for 1.6-3.7 billion tonnes of emissions reductions. This could become one of the largest sources of demand worldwide. We know it’ll be a big deal, but exactly how the deal shakes out remains to be seen. While the emissions reduction goal has been agreed to, the details around implementation of CORSIA – for instance, which standards, protocols and vintages will be eligible – are still being ironed out. With CORSIA set to begin in 2020, the coming months and years will be an interesting time to follow CORSIA developments. What does this mean for airlines already offsetting? That’s a good question. Right now, some airlines offset a portion of their emissions, either for compliance purposes (i.e. they are required to under a carbon pricing program) or voluntarily, usually through passengers who purchase offsets for the emissions associated with their flights. Currently, only a handful of compliance programs cover airline emissions: namely, the EU-ETS and several of China’s pilot provincial cap and trade programs– and even those only apply to flights within the country or European Union. Some airlines voluntarily offset some of their emissions, or offer passengers the option to offset their flight’s emissions. In fact, half of the world’s ten largest airlines offer passengers the option to offset their emissions, including at least one airline from every region around the world. Many of these airlines were some of the first companies to engage in voluntary offsetting – either by offsetting some of their own emissions or by allowing customers to offset emissions associated with their flights. The question remains whether airlines will continue to offset voluntarily in addition to meeting their compliance obligations under CORSIA. Once CORSIA takes effect, there will still be an opportunity for voluntary offsetting, either by customers or airlines. That’s because CORSIA caps post-2020 international aviation emissions growth; airlines will still need to do more to reduce current rates of emissions. ICAO and airlines will need to figure out how to avoid double counting, but so will almost every other industry once the Paris Agreement goes into effect. So what kind of offsets can airlines buy? Are they the same as what they’re using now for their voluntary offsetting? That’s jumping the gun a bit – right now, the question is whether or not the CORSIA program will allow the use of offsets certified by voluntary carbon offsets standards. In February of this year, I attended the first ICAO Seminar on Carbon Markets in Montreal, where ICAO brought their policymakers and negotiators to hear directly from members of the carbon markets community and gain a better understanding of how existing markets work. I gave a presentation about voluntary carbon offsets alongside representatives from a variety of existing carbon markets and standard bodies, including the Clean Development Mechanism, voluntary market standards and country program officials from Japan, China, Korea, Canada and the EU. This seminar provided airlines, industry groups, ICAO officials and others a chance to learn more about things like the available supply of offsets, how standard bodies certify offsets, and how registries track offsets throughout their lifecycle. In June of this year, ICAO released its Standards and Recommended Practices (SARPs), which detail the implementation of CORSIA, including: the program’s administration; information about how airlines should conduct their emissions monitoring, reporting, and validation (MRV); and offsetting and low carbon fuel use requirements. What the SARPs do not include much information on is what types of offsets will be eligible. Some immediate, and much awaited next steps for the ICAO Council (represented by 36 member states), are to discuss and approve the criteria for eligible “units” – ICAO-speak for offsets. The Council will also establish a Technical Advisory Body (TAB), which will consist of a smaller group of representatives who will make recommendations to Council on specific offset programs and whether they meet the criteria. Ultimately, the ICAO Council will make final decisions on what offsets are eligible for use by airlines. This is a big task ahead – and one which we are excited to see unfold. So what’s happened since CORSIA was announced? Are you starting to see any of those shifts in the voluntary markets? In the data we have tracked and market actors we hear from, there’s a lot of enthusiasm and anticipation to engage with CORSIA but little in the way of market activity. That could be just a reflection of what we’ve seen, and what is public; however, I also think it is likely that market participants are wary of investing ahead of clear signals regarding offset eligibility. Earlier this year, we conducted a survey asking market participants and other experts how they thought upcoming markets – like CORSIA, developments under Article 6 of the Paris Agreement and domestic carbon pricing programs – may affect the voluntary carbon markets. Most respondents viewed CORSIA as a positive new opportunity, regardless of which offsets CORSIA recognizes as eligible. That’s because the survey respondents found value in raising overall awareness of offsetting, and thought that engagement with voluntary offsets would rise because of that. However, despite this generally favorable outlook, nearly all respondents reiterated the same word when describing the future of voluntary carbon markets: uncertainty. In short, we’ve seen a lot of interest in CORSIA but not a lot of actual activity. While there may be some airlines looking to get experience with voluntary offsetting before CORSIA officially starts, most will probably hold off until the market kicks off. Project developers, in turn, will likely wait for more guidance around offset eligibility before investing in new projects or expanding capacity in their existing projects. So what’s the debate about vintages? Why does it matter what year the offsets were issued? Simply put, an offset’s vintage is the year that offset was produced. Scientifically, a unit of emissions reductions is equivalent, no matter how, where, or when it was achieved. But economically, which vintages are and are not accepted under CORSIA could drastically affect offset supply and demand. At the end of the day, there are valid arguments on both sides of the fence, and the best thing regulators can do is to make their decisions available as quickly as possible to market participants. I know there have been concerns raised about double counting. What are those? Will ICAO address these? Or is this a matter for UNFCCC? There are a handful of different ways in which ‘double accounting’ can happen – from the double counting of a claim to an emission reduction itself to double use of an issued credit. The basic principle is to make sure multiple claims aren’t happening over the same actions, whether intentionally or unintentionally. ICAO will inevitably have to look to what is happening under the UNFCCC, which is currently in the process of developing guidance to address double counting of markets under the Paris Agreement. Ultimately, though, the ICAO Council must make decisions for CORSIA. In doing so, the ICAO Council has a responsibility to make sure offsets they deem eligible under CORSIA do not result in double counting. This was captured in the 2016 Assembly Resolution on CORSIA and in work done by the Global Markets Based Task Force (GMTF) on emissions unit criteria (which is now viewed by the Council). Will EM track CORSIA offsets?